Quiet Air by SCM !!!!!!!! 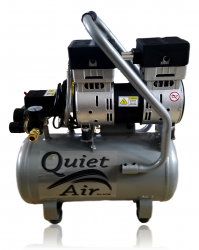 This portable Heavy Duty compressor is very popular. It is only 60 decibels.....that is as quiet as a regular conversation....This unit will run the 400xs Power Carver engravers. It is perfect for the Jet Stream One. Great for shows or apartments! Spec's 3/4 Horse Power 4 .7 gallon tank 60 decibels . Extremely durable. 1 year warranty 100v 8ft hose included. Size is 18" x 20" x 9" wide. NOTE...We can only ship to the lower 48 states.